Exchanging vows of forever in a quaint and verdant garden wedding venue offers more advantages than the traditional hotel weddings. For one, you are afforded breathtaking photographs that are reminiscent of the romantic Victorian era, and the reception hall has fewer restrictions compared to a concrete edifice. Yet, we’ve encountered brides that are worried about their wedding gowns. One particular bride chose a wedding gown style with full skirt, and she’s afraid she might trip while walking or dancing. We understand her concern, and for all you brides-to- be out there who share the same problem, we present you with solutions on how to still be able to have the wedding gown of your dreams and have a grand time at your garden wedding party. Wedding gown sketch by Reem Acra. So you finally saw that ball gown is not for you. So what? There are tons of other silhouettes for wedding gowns that you may choose from and still look absolutely gorgeous. Empire-cut wedding gowns also give off the same elegant vibe like that of a ball gown, but it is much more comfortable. A-line multi-tiered skirt in delicate lace can also be another option for your garden wedding. The basic rule of thumb is that you need not sacrifice comfort for beauty. 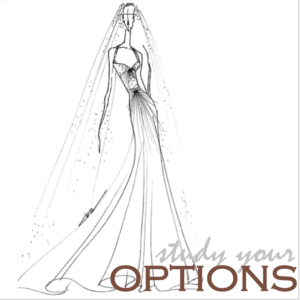 These two should not be mutually exclusive when deciding on your wedding gown. Wedding shoe sketch by Manolo Blahnik for Kate Middleton. 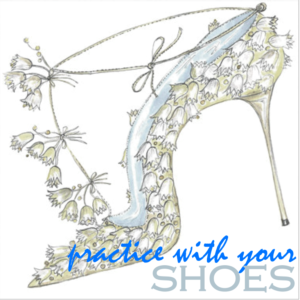 If you are wearing a pair of stilettos or pumps, and you are not the type of girl who can run in heels, it is better that you practice walking and dancing in your wedding shoes. This will give you an idea how to balance your body weight while wearing them, and it will definitely be easier on the day of your wedding. Beyond aesthetics, a professional fashion designer is equipped with mathematical knowledge on how to make your wedding dress stunning, but you have to tell your designer your concern. Your designer knows how to play with your body type by focusing on parts that you would like to highlight, and he or she can solve your tripping nightmares. Ball gowns must have enough room in the front to make walking easier. Do not take fittings for granted, and it is advisable that you bring your wedding shoes to your fitting to give you an actual feel of your ensemble.